Dear reader in our previous post we have discussed about seismic design categories. Apart from structures in seismic design category D, E and F, pier & curtain wall foundation is allowed in international building code. The condition is- this should support light structures having less than or equal 2 stories over ground plane. a. Every load bearing wall should be supported on concrete footing connected continuously and integrally bonded with footing for exterior walls. 2. Actual thickness 92 mm. 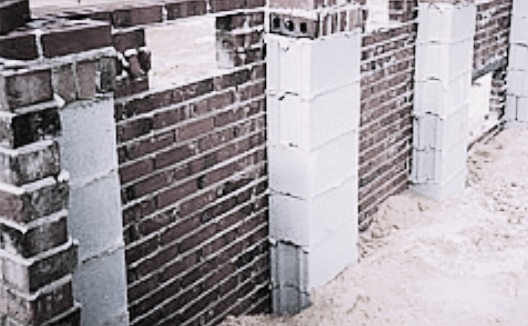 The masonry walls should be integrally bonded with piers having spacing 1929 mm on center. 3.Walls having length less than 610 mm (24 inches) should be taken as isolated piers/columns. 4. Adobe units should not be use for isolated columns/piers in load bearing capacity. 5. Regarding unsupported height of masonry piers, code limited it not exceeding 10 times of it least dimensions. 6. Sometimes hollow masonry units of concrete or structural clay tiles are adopted for pier construction. The piers that support beams or girders constructed of such materials, the cellular spaces should be filled up with concrete or mortar to be treated as solid. Now we will learn about different mortar type according to ACTMC270. IBC recommended to use unfilled hollow units in construction of piers. But unsupported height should be equal or less than 4 times of their least dimensions. 7. Hollow piers should be capped by providing solid masonry of 4 times thickness, sometimes concrete may be used to cap or cavities of top course should be filled up with grout or concrete. c. Some recommendation about timber frame walls or floors; the load bearing foundation wall (masonry, not concrete) having thickness 102 mm, supporting timber frame walls or floors should have height equal to or less than 4 feet. RetroWAL™ provide Interior curtainwall Retrofit System. interior storm windows, blast mitigation, thermolite secondary glazing, laminated glass window installation.